I've figured out why some iTunes users have been reporting problems with subscribing to the Rubenerd Show through the iTunes Store. I deleted my own subscription, searched for "Rubenerd Show" in the iTunes Store and resubscribed to only be given a small circle and an exclamation point. When I right clicked and chose "Show Description" I was given the above dialog box. No wonder it isn't working, it's trying to access new shows from http:///show/feed/ for some reason! I don't know how or why this happened. I'll be contacting Apple about this to see if I can get it pointing back to the proper URI again. 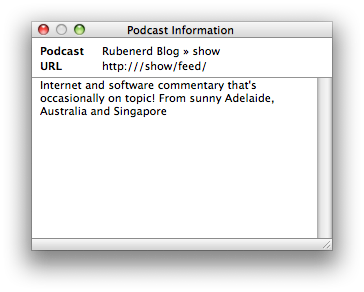 I believe my good friend Felix Tanjono submitted my podcast to the iTunes Store back in 2005 back when Australia and Singapore didn't have access to it. Sorry about this, I don't know how this could have happened :-(.